My kids have the best pediatrician, who my family affectionately refers to as Dr. Pete. My boys actually look forward to visits with him. He has nicknames for them, tickles them, gives hugs, and makes jokes about farting and poo (aka, boy humor). I think he's the best because he really knows his stuff and never hesitates to thoroughly answer any and all of my questions (no matter how dumb they may sound to him). Another thing that makes him super cool: we feel pretty similar when it comes to food. A couple visits ago, we chatted about The Omnivore's Dilemma and how much better a fresh egg tastes than its grocery store counterpart. It was pretty great. A couple weeks ago, I thought my six-year-old had strep throat again, so we paid a visit to Dr. Pete. When he came to tell us the test was negative (hooray!) and as he examined both boys (because they'd had the same virus, it turned out), we got on the topic of food again. That's when he asked if I'd ever made yogurt. I told him no, that I'd wanted to for a while but that it'd always seemed tricky. He proceeded to tell me how easy it is to make. I was convinced. That same day, I went to the store, picked up the ingredients, and made my first batch of yogurt. 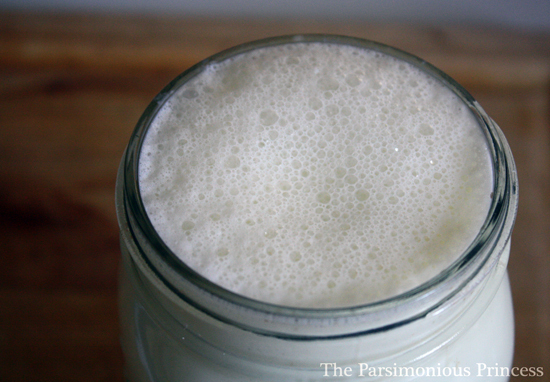 He wasn't kidding: homemade yogurt is so easy to make! 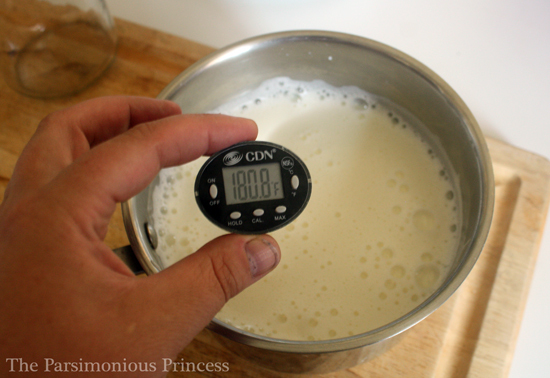 Not only is it really easy to make your own yogurt, it's also much cheaper! To make a quart of yogurt (and this is with organic milk, which can cost a bit more), it only cost around $1.50. 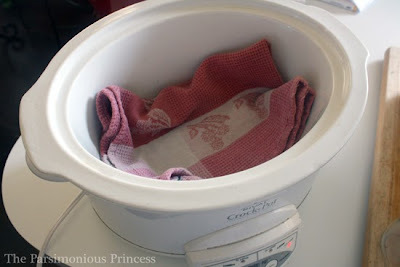 Plug your slow cooker in and set it to 'warm' or to its lowest setting. Put one of the dish towels inside and put the lid on the slow cooker. Pour the milk into a medium saucepan and heat it over medium heat, stirring often so it doesn't scald. Remove the pot from the heat. Wait for it to cool to 110°F. This is the longest part of the process. You can let it cool at room temperature (which is what I've done), but I read recently that you can also put the pot into a larger bowl or sink with ice water. 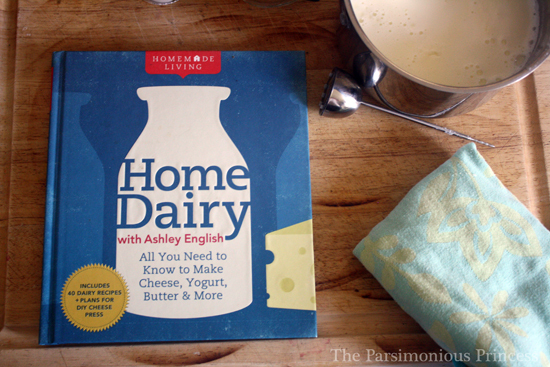 While was I waiting for this batch to cool, I flipped through Home Dairy with Ashley English. 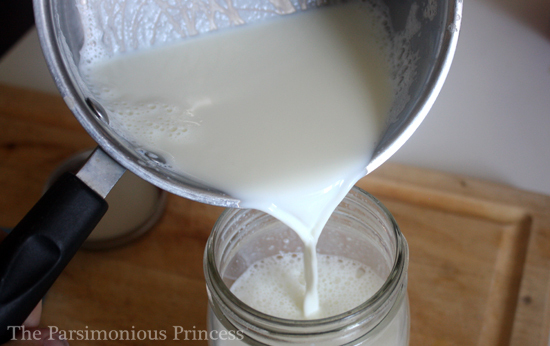 I'm telling you, there's something super-empowering about making your own dairy products. I can't quite explain why, but it is. So far, I've made butter, mozzarella cheese, and yogurt. I can't wait to try making feta, cream cheese, and kefir next, among a bunch of other things. If you're interested in making your own dairy and feeling all cool and self-sufficient, Home Dairy is a wonderful resource for making a wide range of dairy products; another great book with fantastic beginner dairy recipes is one of my favorite cookbooks, The Homemade Pantry by Alana Chernila. 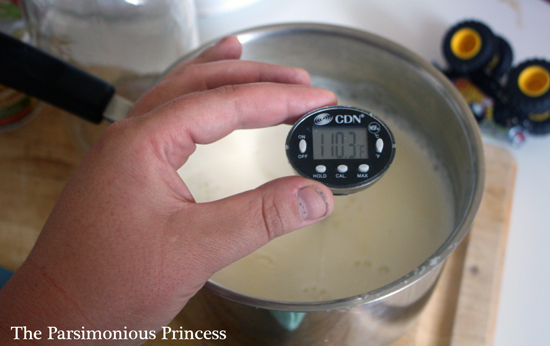 Once the milk has cooled to 110°F, mix in the three tablespoons of yogurt with a metal spoon. 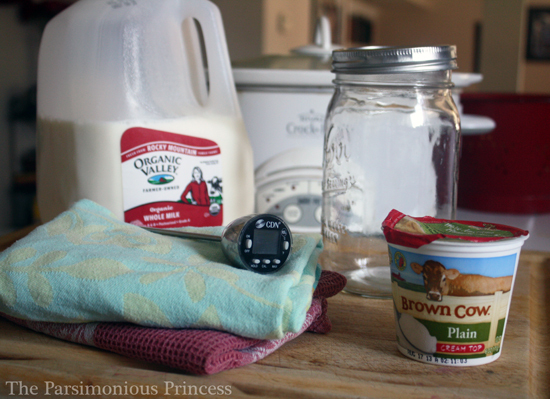 Pour the milk-yogurt mixture into a quart-size Mason jar. Place the lid on top and screw the ring on tightly. 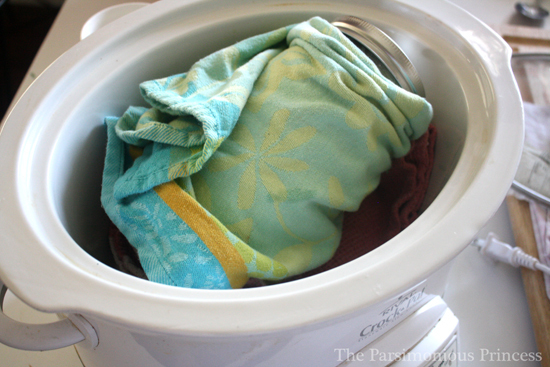 Wrap the jar in the other dish towel (it's like insulation) and put it into the slow cooker. It looks like you're putting a baby to bed. Unplug the slow cooker and put the lid on it. Leave the jar in the slow cooker for six hours (or overnight) and let the cultures work their magic. ...it turns into yogurt -- fresh, tangy, delicious yogurt! Before serving, let the yogurt chill in the fridge for an hour or two. It's a good idea to set three tablespoons aside in a little jar or other container for your next batch of yogurt (I had to buy another cup of yogurt since we ate ours up without thinking ahead). This yogurt will keep in the fridge for about 2 weeks -- the longer it's in the fridge, the more tangy it'll get. Serve this with some fresh fruit, granola, or sweetened with honey or syrup. I learned on Dyno-mom about villi yogurt. It's awesome. I just culture it on my counter top in a mason jar. I save a few tablespoons to add to a new jar with milk, set it out on my counter and the next day, it's done. I ordered my culture from cultures for health a couple of years ago, and it's still going strong. It does sound like you have a great Dr. They are hard to come buy. My boys eat yogurt like crazy! I'm trying this recipe tonight!! Thank you! 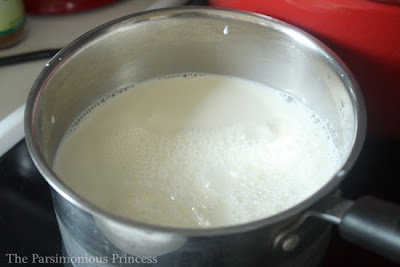 I've just started making my own yogurt. I don't have a slow cooker, but I found an Easiyo maker really cheap ($17) which is great and I'm making 1kg of fresh yogurt every 3-4 days! The taste is awesome! I personally prefer to use milk powder: I prefer the consistency and flavour it comes out with and it is cheaper than milk. A GREAT doctor is SO hard to find! Lucky you! In my blog I tell you how to make Greek yogurt, but with the heating pad method all you have to do is leave it for 16 to 24 hours and it's VERY thick. FYI - this makes several times that I've run across your blog, good info. I'm following! This turned out great, I do wish I had poured off the whey before I put my yogurt in the fridge so it wouldn't be so runny, next time I will. I'm so excited about this method! I think I will sell my yogurt maker, one less appliance, hooray for more space! It's me again and over a year later, I'm back to the oven light method and it's the easiest and produces the thickest NO whey yogurt. I use pint jars or Weck jars that are about the size of a cottage cheese container, they hold about 2.5 cups. I think the smaller jars cause the yogurt to become thicker. This stuff is thicker than any grocery store Greek yogurt, and NO whey on top so no sliminess.